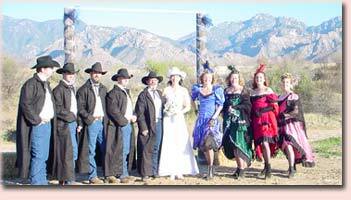 Hello and thank you for visiting the Tucson Weddings website! Allow me to introduce myself; my name is George A. Darmody. I am an non-denominational minister. My ministry serves couples who wish to be married, but have no specific religious affiliation. My ministry services help those couples who wish to be married and want more than a cold courthouse or justice of the peace wedding. I have been performing wedding ceremonies in Tucson and Pima County for over fifteen years at private homes, gardens, restaurants, hotels, resorts and almost all other popular venues around Tucson. I work directly with the couple providing drafts of ceremonies, help in writing marriage vows and customizing ceremonies to help make the wedding day more meaningful than a cold and impersonal courthouse or justice of the peace office. Ceremony performed at Push Ridge Stables. When couples plan for a wedding, they spend a considerable amount of time on the details of the wedding theme, flowers, guest list and reception. They often overlook how the wedding ceremony is conducted and the importance of the exchange of wedding vows. Guests will not only remember the reception, but they'll also remember the words the bride and groom use to express their commitment to each other. The importance of a well conducted service is even more pronounced when the ceremony is taped. My goal is to make your ceremony as memorable as the wedding day itself. Thank you for considering my service; I hope to see you on your wedding day!